In Brussels it's snowing and the cold drives everyone indoors, to bars, offices and warm apartments, but inside the talk goes on. 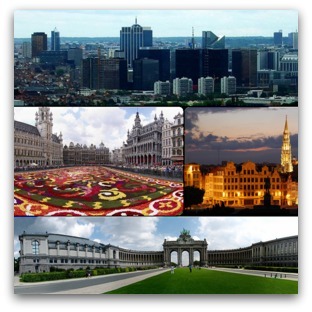 Brussels is a talking city. In the bars outside the European parliament the young bureaucrats and staffers gather and 'network' over two euro pints of Belgian beer. Leaning back on their heels and stroking their cashmere scarves they will tell you with a glow of satisfaction that they 'simply adore the policy process', that they could talk all day about wheat subsidies and clean energy technology. They read fact books rather than mere novels and they keep up to date with the details of Canadian politics as an exotic hobby. But on the other hand Brussels is full of dreams — encapsulated in schemes, political movements, party politics and the ambitions of those hordes of interns who flood the city. The European project is of course the great dream and the young people who come here to work are animated by it — in one way or another. The other night a group of us were having dinner in a noisy restaurant. The conversation turned from football to politics and then, as the dishes crowded the table and the wine flowed, to spirituality. We came to talking about being young and Catholic in Brussels, and our conversation made apparent a common experience: we're all swept up in the fast stream of life here while at the same time trying to make space for 'the world of the spirit'. The philosopher Charles Taylor has a phrase for it: religious faith, he writes, points us towards 'a deeper transformation' in our lives, an uncovering of buried intuitions. What we're all trying to work out is where the transformation can be found, how it can be effected. After dinner we slip and slide our way over the icy pavement, throw a few snowballs, hug each other goodbye and part ways, off to bars or to meet friends. But Taylor's words stay in my head — 'a deeper transformation'. Sunday mass couldn't stand in starker contrast. It's a quiet, snowy morning and the fair women and the brave men are asleep — and every inch of my body tells me I should be too. The music begins and a tiny old woman gurgles behind me, in squeaky broken tones le seignue-e-e-er! interrupted by rasping coughing fits. I try to focus on the cross and in my mind I repeat Thomas Merton's words: 'to learn to know the Christ of the burnt men' — what did he mean by 'burnt men'? But the coughing is getting worse, and between muttered prayers it sounds like the pew behind me is hosting a cardiac arrest. For Alison, becoming 'unexcited' allows us to dwell 'in a quiet place', a place that 'increases our attention, our presence and our appreciation for what is around us'. And in a place like Brussels with all its excitement, becoming 'unexcited' seems important. As it happens, my work in Brussels demands an increase of attention. Over the coming months I'll be working with the Jesuit Refugee Service European office here in Brussels on a report on migration control policies in the Western Balkans. I'll be travelling to Macedonia and Croatia to interview asylum seekers detained in those countries. And I'll be writing in this column every month, reflecting on some of the themes above, and on what I learn from my work here. Throughout I hope to be able to explore further what Taylor means, in the context of busy political life, by being 'transformed', and open to the transcendent: something that runs deeply and quietly beneath everything else. Benedict Coleridge is a policy researcher with Jesuit Refugee Service Europe, based in Brussels. This is the first installment of a new monthly column. To be trivial, the author of this piece has the best name ever. Benedict Coleridge: quite a mix! What a joy it is to read Benedict Coleridge's reflections. He has become a favourite in my Eureka Street experience. There is always an ability to explore the deeper questions that face those who want to be "religious", "spiritual" and "Catholic" in this fast moving and sometimes disorienting world. I wish him luck with his important work and congratulate him on being a light for his generation. I found what Benedict said about theologian James Allison interesting. Becoming 'unexcited' allows us to dwell 'in a quiet place.' Such experience lies at the root of all meditational practices which are designed to bring us into a deeper relationship with God which can only be achieved if we are still and listen. Such an approach is particularly exemplified in the teachings of John Main and Laurence Freeman and the Christian Meditation Community, as in many other traditions as well. I am almost sixty years older than Benedict. When his name comes up in Eureka Street, I am overcome with impatience and eager anticipation to read his latest contribution. I hope he is a light for his generation. He is for me. at the other end of life, as I explore what is significant in my spiritual experiences. What a joy that he will be a regular contributor! Tranquility, transformation, transcendence, tolerance... Conversations and silence... Seeing poetry in the everyday... Thank you, Benedict. I don't see why church should be boring or quiet. Yes, we need moments of reflection, but worship is also experienced in the bible as 'shouts of joy'and 'cries of praise'. Should that not also be part of Catholic worship? I agree - the Mass is supposed to be seriously underwhelming! No, wait, Rebecca's right - what about shouts of praise? I have to think more about this - well done, Benedict Coleridge! I agree with Rebecca. I wonder if young people may sometimes feel like they have to present a "fake" serious front when in church. Perhaps we are afraid that encouraging "shouts of joy" and "cries of praise" might get out of hand? I suspect expectations of and reactions to the Mass/Eucharist/Liturgy vary quite considerably according to the person involved and where they are coming from. After years of being enamoured with Thomas Merton I now find his insights somewhat unsatisfactory. He seemed, to me, someone who always ended up feeling dissatisfied and unfulfilled after the initial euphoria wore off. That may very well be the right attitude with social justice, where new issues come up all the time, but I think it emphatically wrong in approaching the Mass. I find Joseph Campbell, who was brought up Catholic, far more insightful here. He saw the Mass as a tremendous drama of the universe which should overwhelm and raise people up out of their mundane lives. Teilhard de Chardin's view as expressed in "The Mass of the Universe" was similar. I find the insights of poets, such as T S Eliot and John Betjeman, more meaningful to me than many modern theologians, who often do what I would call "a reverse Rumpelstiltskin" on things. I think you have to let the sacrament alone and let it work its magic without over intellectualising. The traditional Orthodox/Eastern Catholic view of the Liturgy is similar. I would find it impossible to be underwhelmed by the Eucharist. Whatever odd behaviours are going on in the church are subsidiary to the Divine Mystery. I found the worst Eucharists I attended were ones which fostered a specious and intrusive involvement of those unneccesary to and intrusive of its central purpose. I am thinking of interminable intercessions; orgies of handshaking at the Peace and post-communion hymns which are intended to show the supposed talent and versatility of the choir. Where prayer has been valid." "Prayer" as Eliot goes on to say is far more profound than its intellectual or verbal aspect. I think you do have a sense of the numinous. I hope your travels in Eastern Europe will expose you to the beauties and wonders of Orthodox and Muslim spirituality as well as those of Catholicism. You are extremely intelligent and insightful and I am sure they will. I look forward to reading your column. Bwen's Q: "...where [can] the transformation...be found?" “Mass should be boring” is like Jesus saying: “Anyone who comes to me without hating father, mother, wife, children, brothers, sisters, yes and his own life too, cannot be my disciple.” (Lk 14:26) It’s a mental slap in the face – like the symbolic gesture at Confirmation when the bishop slaps you at the end, saying “Peace be with you”! Why do we need it? Because the violent human creature has a tendency to turn “shouts of joy” and “cries of praise” (biblical or otherwise) into the frenzied shouts of a murderous mob drowning out the cries of its victims writhing in pain on the sacrificial altars of this world’s “gods” (mythic, ideological, rationalist or otherwise). That is James Alison’s point, as I understand it. Benedict Coleridge’s (if I’ve understood him) is akin to it: it is much harder to delude yourself and escape the Real in the “seriously underwhelming” than it is in the euphoric spasms of “worship” or the sentimental throws of “adoration” – which God (I hope) permits, but does not require or automatically dispense on demand from us, poor addicts to our emotions and prisoners of our delusions that we are. “Mass should be boring”? Too right! Radically boring through the crust and to the inner core; boring beneath the superficial excitements and inducements to stay sated and staid; boring into the molten madness of a violent mob worshiping itself; boring to the point of tears welling up out of a broken heart … buckets of tears “welling up unto eternal life” … to that place, that peace, Brussels, Europe, Empire and World cannot give and do not know; that peace, that place, that pace, that is in what is here and now in this … here … now. CS Lewis is interesting on this point. In his Letters to Malcolm on Prayer he decries the 'Liturgical Fidget' in favour of permanence and uniformity. Familitarity and habit, he argues, is necessary if the liturgy is to serve as a vehicle of worship whereas novelty runs the risk of focussing attention on the service and celebrant only. He writes: 'As long as you notice, and have to count, the steps, you are not yet dancing but only learning to dance'. His essay, however, does not comment on the vacuous content of many Sunday homilies though they are integral to good worship. Benedict Coleridge has surely made a splendid contribution, first with the article, but importantly too by stimulating varied and thought provoking responses. Edward F says much that resonates with me (reminding me that Betjeman wrote of the memorable, spare, uncluttered interior of a Cornish church where I grew up that it is 'always praying, even when no one is there'). But thank you, all, for what you have given! Whether liturgy is 'quiet' or 'noisy' is determined by the liturgical prayer we pray (spoken or sung) and the liturgical action at the time. Some texts are 'shouts of joy' - the Gloria (Glory to God), Sanctus (Holy), Gospel and Memorial Acclamations, Great Amen etc. Some texts are quieter and more reflective in nature - The Lord's Prayer, Agnus Dei (Lamb of God), Kyrie Eleison (Lord have mercy)etc. But whether quiet or noisy, all are part of the corporate prayer of the people of God – the Church. The liturgy of the Mass or other formal liturgies – morning and evening prayer etc., - especially in light of the Second Vatican Council’s reform of liturgy, is everyone’s prayer, and as such are quite busy affairs. There is always room for quiet meditation in terms of prayer life outside these formal corporate liturgies as above, and there are some points in these liturgies for brief moments of reflection – post Communion in the Mass for example – but generally, these liturgies require full, active, and conscious participation by all who are able.